Hey look, I made another gooey bar. This time I made it SNICKERDOODLE! Snickerdoodle Gooey Bars are so good and made super easy by using a cookie mix. These cookie bars are gooey and sweet and taste like the perfect snickerdoodle recipe! You guys, I’m in shock: I have a cavity. How in the heck did that happen? I brush my teeth three times a day but here I am, preparing to go endure some dental torture. WTH? When the dentist found the sticky spot on my tooth, my stomach sank. Then the guy said, “It’s an easy one, you won’t even need Novocain” and I laughed in his face. You all remember how much I hate the dentist, right? Like, it’s kind of amazing that I’m not taking a valium right now? Or twilight sleep? And how I really hope my dentist likes Hey, Mama because I’ll be blasting it way too loud over my headphones while I white knuckle the chair? That’s my day today. What are you doing? Hint: you should totally make Snickerdoodle Gooey Bars. That’s what I wish I was doing. I seem to be on a bar cookie kick these last few weeks. Pumpkin, S’more, Oreo, Lemon…all in just the last few weeks alone! I think that bar cookies are just so easy and, in the craziness of this month, they’re all I have the energy to make. Cookies require scooping. Cake requires frosting. Pie requires rolling. I just don’t have it in me right now, folks. Plus, when you’ve got a good thing going…why stop? Y’all love all my cookie bar recipes, right? Just say yes, it’ll make me happy today. These bars, like all my others, are super easy to make. You just press half the dough in the pan, top it with my favorite substance (sweetened condensed milk) and white chocolate chips, then sprinkle the remaining dough over the top. Then the snickerdoodle happens: you sprinkle cinnamon sugar alllll over the bars before you bake them. The cinnamon sugar gives a nice cinnamony sweet crunch to these bars. 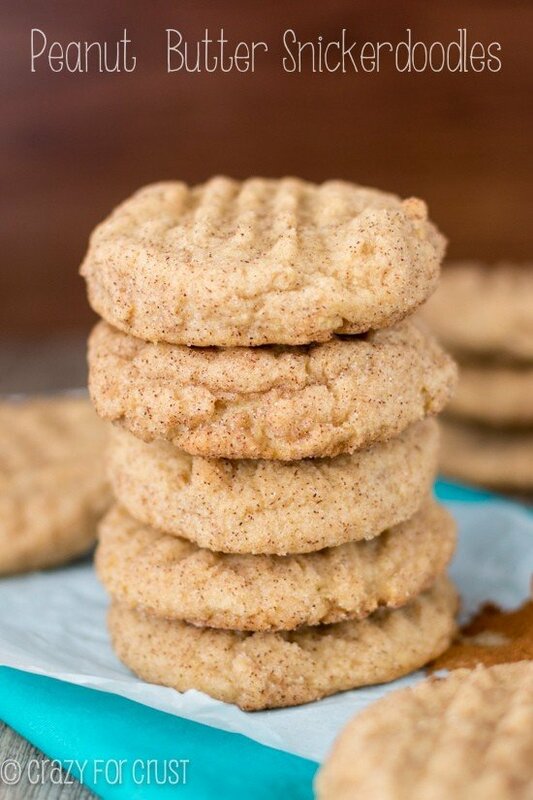 That, along with the cookies themselves and the gooey factor…these are a winner with a capital W.
This recipe is the most recent one in my partnership with Krusteaz. I love their mixes and I know you do too! 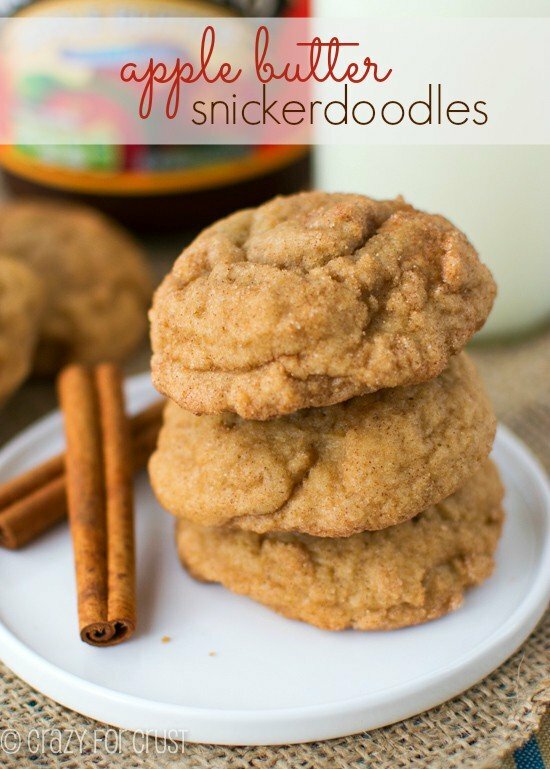 Using their Snickerdoodle Cookie Mix for this recipe made it so easy, it’s kind of unbelievable. If you need easy in your life right now, these bars will help, pinky swear. 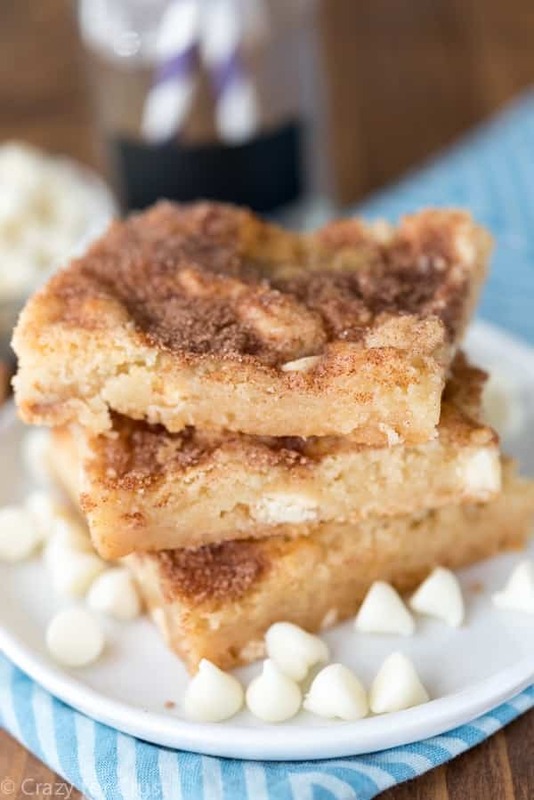 Head on over to the Krusteaz website to get White Chocolate Snickerdoodle Gooey Bar Recipe! Check out all my gooey bar recipes too! 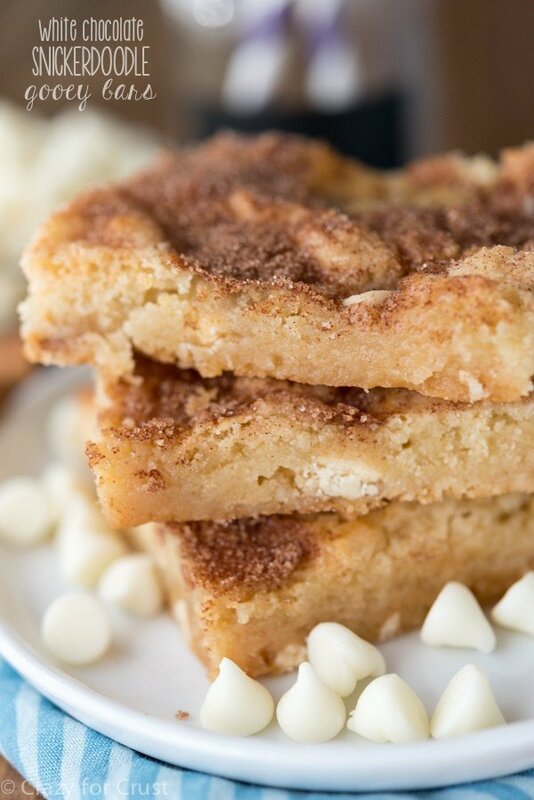 These White Chocolate Snickerdoodle Gooey Bars are easy to make with Krusteaz Snickerdoodle Cookie mix!! Preheat oven to 350°F. Line a 9x13x2-inch baking pan with foil and spray with nonstick cooking spray. Mix cookie mix, butter, and egg in the bowl of a stand mixer fitted with the paddle attachment, or you can use a hand mixer. Mix until dough forms. Press 1/2 of the cookie mix into the bottom of the prepared pan. Top with sweetened condensed milk, keeping it away from the edges of the pan. Sprinkle evenly white chocolate chips. Drop remaining dough by spoonfuls evenly over the top and spread them slightly to cover using your fingers. (It might be easier to spray your hands with cooking spray first.) Sprinkle the cinnamon-sugar topping over the top of the bars. Bake for 25-35 minutes until the bars start to get golden brown. The center might still be a little jiggly, but it’ll firm more as it cools. Cool completely before slicing. Bars are very gooey! Chilling them will make them less gooey and easier to cut, if desired. If you can't find the Krusteaz snickerdoodle mix, you can use any other brand of cookie mix. Click HERE for more easy recipes that start with cookie dough or cookie mix! This post was sponsored by Krusteaz. All opinions are 100% my own, as usual. Thank you for supporting the brands that make Crazy for Crust possible. Also, try the Krusteaz Snickerdoodle Cookie Mix. OMG, delish! Wouldn’t it be nice if we could sprinkle cinnamon sugar over every thing in life to make all things better?! The only thing worse than getting dental work done is NOT getting dental work done and waiting until a little deal is a BIG deal. The only thing better than cinnamon sugar on gooey bars is…..I can’t think of anything. 🙂 Good luck at the dentist, Dorothy! You had me at white chocolate … and snickerdoodle … and gooey bar. Basically, I just love everything about this treat! 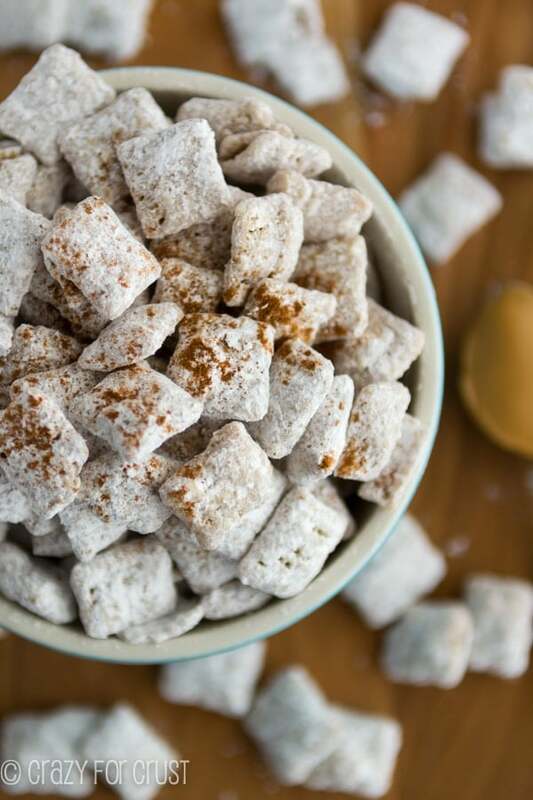 The Krusteaz Snickerdoodle mix is the best snickerdoodle we have ever made! Once we make one box, it is like we can’t stop for the next month! These bars look equally amazing. Yep, I’m officially in love with these bars! Hi! I tried a couple of your recipes and so far really like them. I had trouble with this one though, I’m not sure if somehow I overmixed the dough or something else went wrong, but I don’t understand how it could possibly fit the bottom and top of the 9×13″ pan. This was anything but easy for me, it took a good hour to get done because I was trying so hard to cover the bottom of the pan with so little dough, and even still I didn’t have enough for the top so about 1/3 of my bars ended up without the top. Do you know where I could have went wrong? I think this recipe would have worked in a 7×11″ pan better for me. It was definitely a 9×13 pan because when I was making them I made a note to myself that the batter was so thin! If you spray your hands with cooking spray the spreading is much easier and faster (or you can wet them with water). The top has drops of the batter that don’t spread thin, so that’s much easier on the top. If you have a 7×11 pan, it’ll work perfectly as well, and not be as thin. I’m not sure if I’d go as small as a 9×9, but 7×11 would work just fine!